Each month, each season, brings with it a new variety of things to do in Jamaica. I hope this calendar of events will be helpful to you. If you're planning your trip around a particular event, I would suggest that you double check dates with the event organisers before making a booking, in case there are late-in-the-day changes. In each month I've listed the happenings in St. Elizabeth and the south coast first. Although not in the main tourist belt, this side of the island shouldn't be missed. I'll keep adding to the list as soon as I learn of interesting, new things to do in Jamaica. Caribbean Fashion Week. National Indoor Sports Centre, Kingston. Black River Day - The Ultimate Street Festival!Fun in the streets of Black River, St. Elizabeth. Float Parade, Stilt Walkers, Jonkunnu, Mento Band, Steel Band, Stage Show, Food Booths, Kids Village. July 31, 2015. With Emancipation Day on August 1, and Independence Day on August 6, it's a month of special things to do in Jamaica. 2015 will mark the 53rd year of Independence. The culture of the island is on display in August more than in any other month, and the whole country is in a party mood! Emancipation Vigil St. Elizabeth -Black River Town Square, July 31 - Aug 1, 2015. Part of Black River Day Celebrations. Miss Jamaica Festival Queen Coronation - Ranny Williams Entertainment Centre, Kingston. Aug 1, 2015, 8pm. Miss Lou Birthday Celebrations - Cultural activities at venues across the island in honour of Jamaica's beloved Louise Bennett Coverly, a cultural pioneer. Falmouth Marlin Tournament - Falmouth, Trelawny. Hook 'n Line Tournament - Treasure Beach, St. Elizabeth. Burger King 10k Run - Montego Bay. Call 876-922-8677. Heroes Day - Civic ceremonies in all parishes honouring Jamaica's National Heroes. JCDC Visual Arts Showcase - Bloomfield Great House, Mandeville. Holland Bamboo 5k Run Holland Bamboo, St. Elizabeth. Call 876-922-8677. Restaurant Week - Various restaurants in Kingston and Montego Bay offer reduced prices, showcasing the range of cuisine available in Jamaica. If you're in Jamaica at Christmas time, make sure to check out Grand Market celebrations held in most major towns on the night before Christmas. GT Magnum Christmas Extravaganza - Reggae/Dancehall stage show held annually at Independence Park in Black River, St. Elizabeth. December 25, 2015. Black River New Year's Eve Jam - Waterloo Guesthouse, Black River, St. Elizabeth. Starts December 31, 2015. Fireworks and New Year's Eve Party at Jack Sprat in Treasure Beach, St. Elizabeth. Starts December 31, 2015. Reggae Marathon - Marathon, half marathon and shorter races held in Negril each year. www.reggaemarathon.com. East Fest - Reggae artistes come together in a celebration of Rastafarian Culture. Goodyear Oval, St. Thomas. Sting - Eagerly anticipated by dancehall fans each year, Sting is the biggest one night dancehall show. December 26, 2015. Harbour Fest and Fireworks on the Waterfront - December 31, 2015. Kingston Waterfront. Accompong Maroon Festival/Cudjoe's Celebration - January 6 each year at Accompong in St. Elizabeth. High Mountain Coffee 10k and 5k Road Race - held in the hills of Manchester. A challenging, but extrememly popular race, starting at the overhead bridge in Williamsfield. Jamaica Jazz and Blues Festival - a huge week long festival of R&B, Jazz, Blues, Reggae, Latin and other music types. Main show nights at the Greenfield Stadium in Trelawny. Visit Jamaica Jazz and Blues. 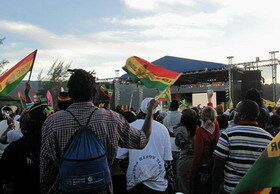 Bob Marley birthday celebrations - Stage shows, exhibitions and other events at various locations around the island. Startime - Vintage Reggae Stageshow - Kingston. Things to do in Jamaica - It's Spring! Hague Agricultural Show - held at Hague in Trelawny. Boys and Girls Championships (Champs) - National Stadium, Kingston. If you want to see why Jamaica produces great track and field athletes, this is the place to be. Spring Break activities - Negril has become Jamaica's Spring Break capital. The Jamaica Orchid Society Show - Jamaica Horticultural Society Exhibition Hall, adjoining Hope Botanical Gardens. Jake's Off Road Triathlon - Treasure Beach, St. Elizabeth. 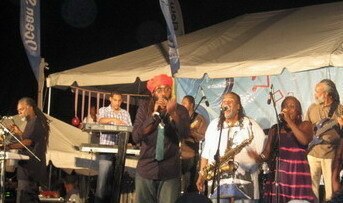 Western Consciousness - Reggae Stage Show in Montego Bay. End of April. Curry Festival - Good food and entertainment, Savanna-la-mar, Westmoreland. End of April. Manchester Horticultural Society Flower Show - another good flower show. Held in Mandeville on Labour Day, May 23rd. National Labour Day Concert - held on Labour Day, May 23rd each year. There's definitely no shortage of things to do in Jamaica!